Believe it or not, when it comes to woodworking, building your own deck is actually on the easier side of the equation. As you all know, we love to look at before and after projects here at homify, and do so on a fairly regular basis. However, a garden transformation happens less often, and when we get the chance to explore one, we must surely jump at it. Today, we have such a chance, and it is definitely no ordinary transformation! The Unjardine de Ville is a project undertaken by Garden Trotter, landscape designers in Paris, France. 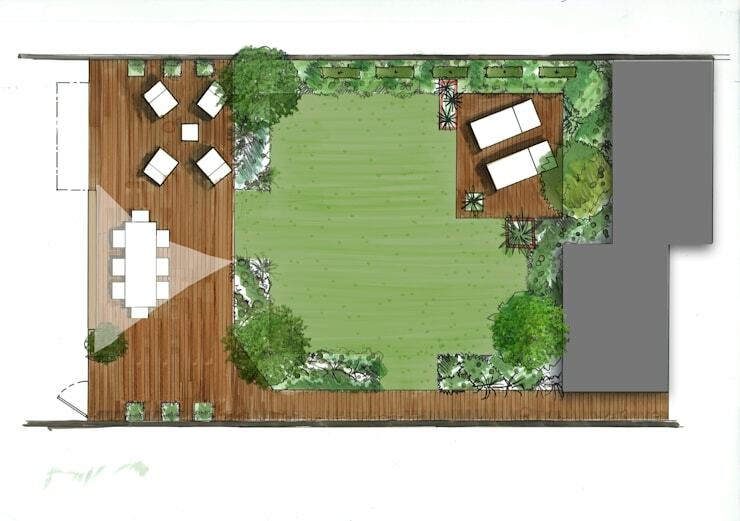 Here we will see the process of a dull backyard space being transformed into a stunning new garden area with fresh accents, ample leisure space, and loads of colourful flowers. We will look at the space as it was before, the visualisation of a new composition, and the actual results. Let's get right to it! When you look at this picture, does it inspire you to spend long hours outdoors, soaking up the sun or appreciating the natural beauty around you? We certainly don't think so, but are sure that the space holds a great potential. 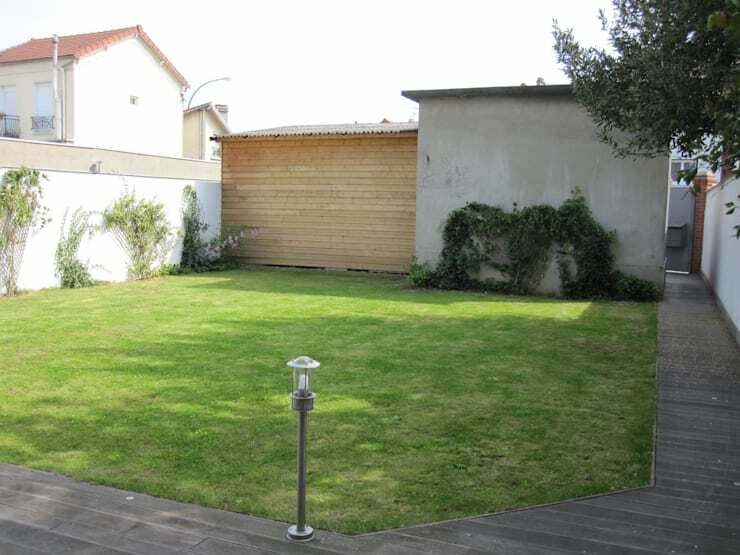 Just look at the spacious inner court covered with grass, and the wooden deck which surrounds it. Here is much that can be done. We also see some shaded space next to the walls of the home, and this should definitely be exploited. The area the designers had to work with, comprises of 250 square meters, and is ample space to host a number of different garden features. The property itself is found in the Hauts-de-Seine, located in the western inner suburbs of Paris. Here we have an artist's rendering of what ideal garden would look like in the space we had just seen. As you can see, there had been big plans for the space, and the projected garden looks much, much better than what we saw in the first image! We can see that the designers planned to border the lawn with beds of shrubs and flowers, as well as line the outer wall with smaller trees. In the upper right corner, we can see plans for the addition of a small wooden platform for sun chairs, which will also make use of the shade provided by the building during certain times of the day. The existing wooden deck that goes around the lawn area will also be decorated with small trees on the side, while also hosting two sets of outdoor furniture. Now, doesn't this look much more lively! Here we have a close-up of the rear of the garden area, right next to the outer wall of the house on the property. We can see the addition of the small wooden platform, on which there is a small garden dining set situated. This furniture is lightweight and mobile, in order for it to be easily moved, should the inhabitants require sun-chairs or other furniture in the space instead. Around this area, there are many shrubs, flowering plants and small trees to decorated the space. This is much more beautiful than the few crawling specimens we saw with the original space. The area is now filled with plants for aesthetic enjoyment and to enhance the natural atmosphere. Let's move over to the wooden decked area of the garden. We can see that the designers kept the wooden deck and walkway in tact as it were before, which was a good move, since it had been in a good condition. Why would you want to change a perfectly good feature if you can easily build your vision around it? 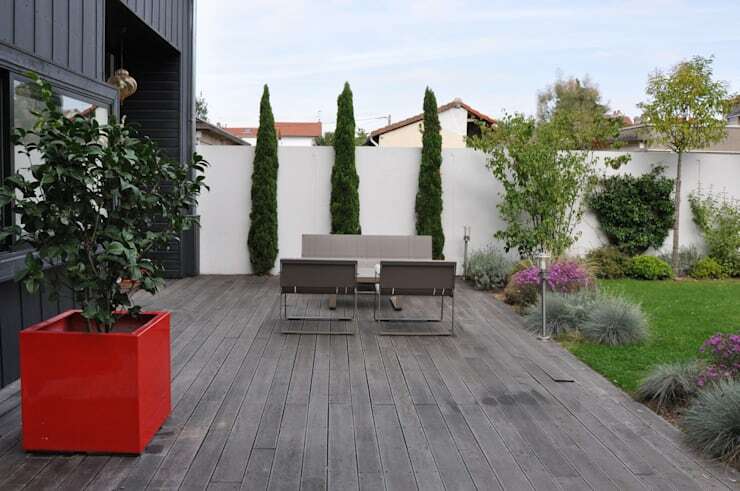 The patio area itself is furnished simply with only a neutral outdoor furniture set corresponding to the one on the smaller deck at the back, as well as a brightly-coloured potted plant. On the patio area against the wall, we can see three stylish conifers lined up for a rhythmic touch. We can also see a lot of the new plants surrounding the deck area, bringing colour and diversity to the entire ensemble. Lastly, we present you with an overview of the new space. Isn't it lovely? 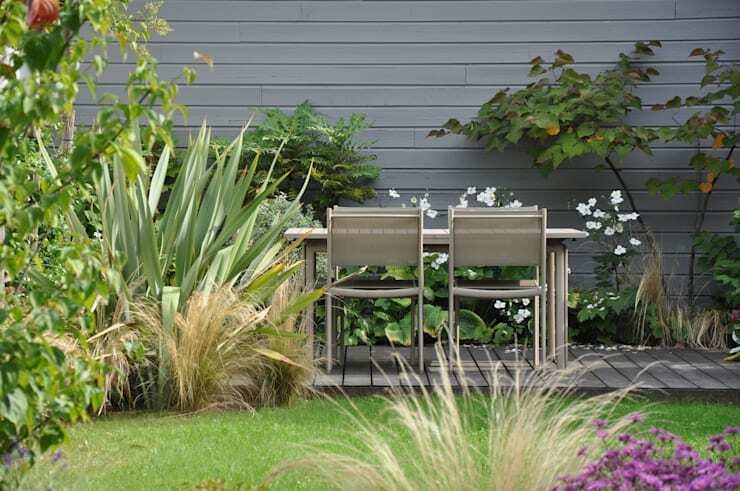 From this perspective, we can see both sets of garden furniture, the lawn, and a broad overview of the great many plant species present in the new space. This is a wonderful attribute of the new area, as the diversity and opulence of vegetation lend a calm and serene atmosphere to the garden. This transformed space looks worlds apart from that which we saw in the first image, and it goes to show what a little bit of planning and imagination can achieve! If you were inspired by this brilliant garden transformation and want to do the same with your own backyard area, but simply do not have the time to go about a lengthy project, take a quick look at how you can: Improve your own garden in only a weekend! Let us know what you thought about this garden transformation in the comments below!